Hench, John (1908-2004) Artist/designer; started in the Disney Story Department in 1939, later painting backgrounds for the Nutcracker Suite segment of Fantasia. He worked on Cinderella and Alice in Wonderland, and aided Salvador Dali in the aborted Destino project. He worked on the special effects in 20,000 Leagues Under the Sea. 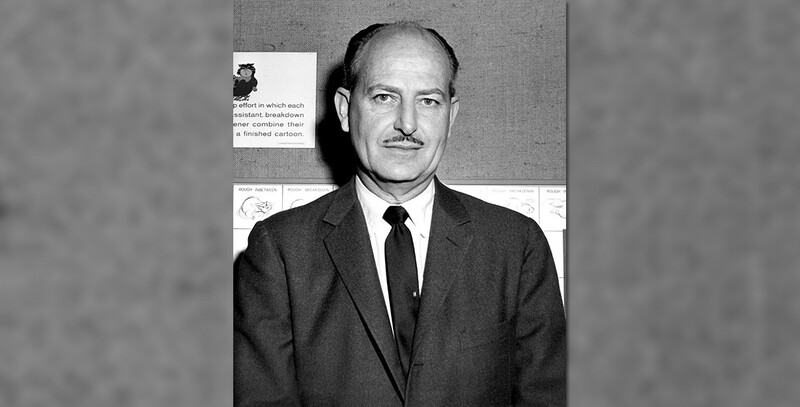 In 1955, he moved to WED Enterprises to work on the Tomorrowland area at Disneyland. In 1972 he was named Executive Vice President of WED. He is known for painting the company’s official portraits of Mickey Mouse for his 25th, 50th, 60th, 70th, and 75th birthdays. In 1999, at the age of 90, he passed his 60th year with the company, longer than any other person. He was named a Disney Legend in 1990.